Google AdWords, the largest online advertising program, can help you increase sales by bringing more customers to your store. It works on a PPC or Pay Per Click system which means you only pay when someone clicks on your ad. AdWords also has a lot of great features – fantastic tools for keyword research, the ability to target ads by the user’s location and even device, as well as the ability to control your daily budget. Let’s take a closer look at how to create an ad with Google AdWords. 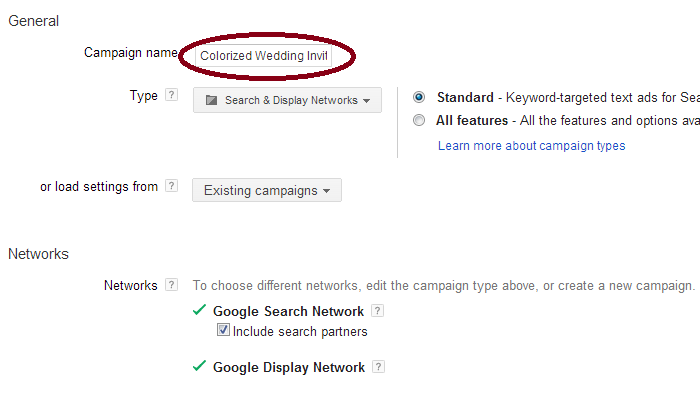 See below for a screenshot of the main interface of Google AdWords. 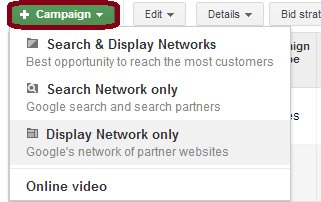 To create an ad, first create a campaign by clicking the “+ campaign” button which is located within the “campaign” tab. Each ad campaign has it’s own budget and parameters which can be edited at any time. There four type of campaigns to choose from: Search & Display, Search Network Only, Display Network Only or Online Video. Search & Display is best for reaching a larger audience. After choosing the type of campaign you’d like to run, you will need to create name. When creating your campaigns, think of how you want to organize them. A few interesting ways to organize your campaigns are by landing pages or product types. For example, I can create a campaign “Colorized Homepage Campaign” or “Colorized Wedding Invitations”. Next is the network section, which we have already selected earlier. The devices and location sections can be left at their default settings. However, if you have a number of products that are in a different language, I would consider creating a different Ad Group that targets countries where people speak that particular language. In this section you can choose your daily budget, and whether you’d like AdWords to set your bids or set them yourself manually. 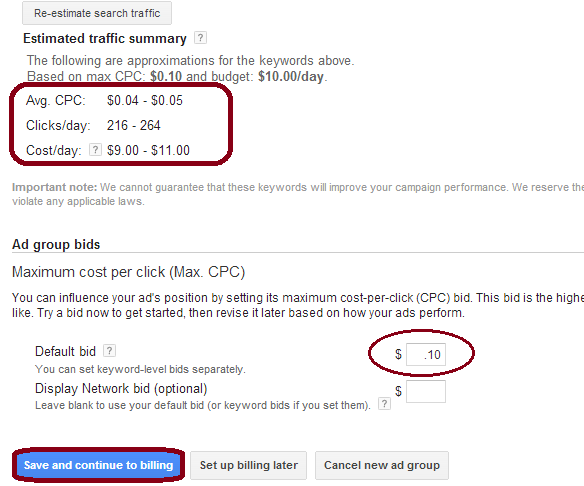 The screenshot below is set to the options for letting AdWords choose the bids for you automatically. If you choose to set your bids yourself, then you will need to choose your Default Bid, or the maximum amount you are willing to pay per click. In the example below, the bid is set to .40 cents, which means I do not want to pay more than .40 cents per click on any ad in this campaign. Location: Allows you to display your physical address below your ad. Sitelinks: Allows you to show several links below your ad for free. Call: Allows you to display your phone number below your ad. Social: Allows you to add your Goolge+ Page to your campaign. The most useful ad extension for an online store is probably the Sitelinks option, which is also a free option. After you’ve fully filled out the campaign section, click “Save and continue” to advance to the Ad Group section. An Ad Group is a group of ads that have similar keywords. When creating an ad, you have several fields to fill out including the headline, descriptions, display URL & destination URL. The ad preview is populated on the right-hand side of the screen. Concise and clear messaging works best. Also, although not included in the example below, having a call to action is a plus. A call to action is a word or phrase that tells customer to act. An example of an ad with a call to action would be “Buy your elegant wedding invitations now”. The keyword section is the most important section of your ad creation process because this is where you are choosing the audience you want to target for this ad. You can use the Keyword Planner to research and use your keywords. It’s good to start with at least 10-20 keywords per ad group. Ask yourself, what do people type in search when they are looking to buy your product? How would you search for your product? An important part of this section is the Estimated Traffic Summary which shows the amount of traffic your keywords can potentially bring. In other words, this section shows you approximately how many clicks you will get per day with your current budget and current max bid. 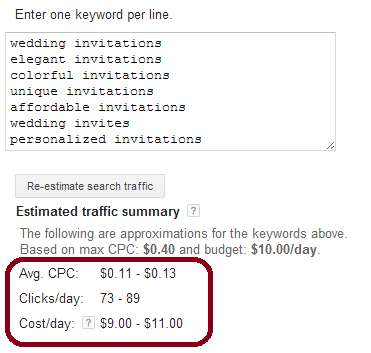 You can change your default or max bid and see how it affects the number of clicks/day. We can see here that when the bid is lowered to $0.10 cents versus $0.40 cents for these particular keywords, the number of clicks/day went up. This is a good section to spend some time on and see the effects of your default bids on your overall traffic projection. Learn more about bids here. Once you’ve filled out the Keyword and Bid section, you can click “Save and continue to the billing” button which takes you to the final section of your ad creation process, and you are all set after that. Your ads will be live as soon as the billing information is complete. Advertising can help grow your customer base and get the word out about your store. It’s a great way to expand quickly if you have little extra to invest. since you explicitly mention Adwords as means of marketing: Do you at zazzle have any Information on Google not accepting affiliates of zazzle on Adwords? Do you know about affiliates that successfully use Adwords to generate traffic to THEIR site, and from there forward adwords-generated visitors to zazzle using affiliate links?